Fashionistas will tell you - accessories are key to any outfit. As a toy collector, I will tell you - accessories are key to any action figure. 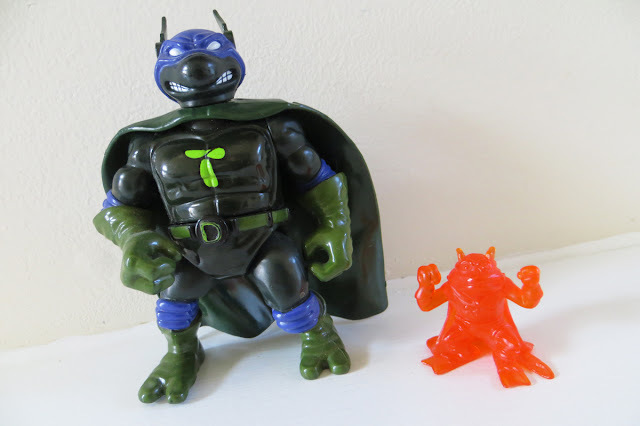 At the height of their popularity, hundreds of TMNT action figures were released. Each one was packed with an assortment of wacky accessories. 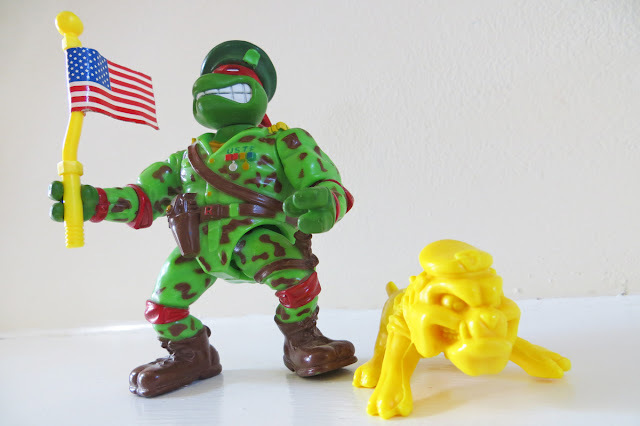 Of the countless pieces created in the 90s, it was the bundled sidekicks that were my favorite. 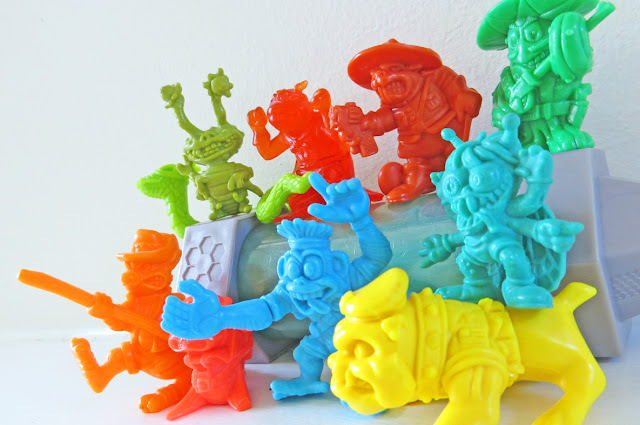 These quirky characters acted as companion pieces to the main figures. 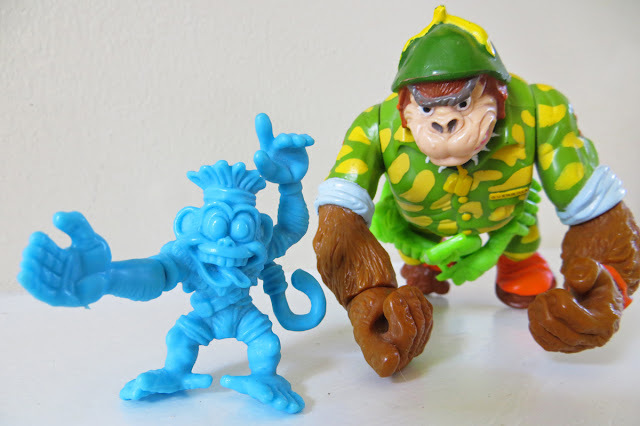 Each hunk of plastic was usually one solid color, lacked articulation, and completely hilarious. There are lots of these little guys dwelling in The Sewer Den. Let's look at a 10 gems. Lock, stock, and loaded. Strapped to the teeth with ammunition, this mini-mutant is leaving any potential ninja skills at the door and going into battle with his guns-a-blazin'. For added intimidation, he's got a worm-like mustache crawling on his demented face. Have you ever seen a cactus so loco? I'm notoriously terrible when it comes to cacti care-taking. Despite their minimal needs, they're doomed under my watch. 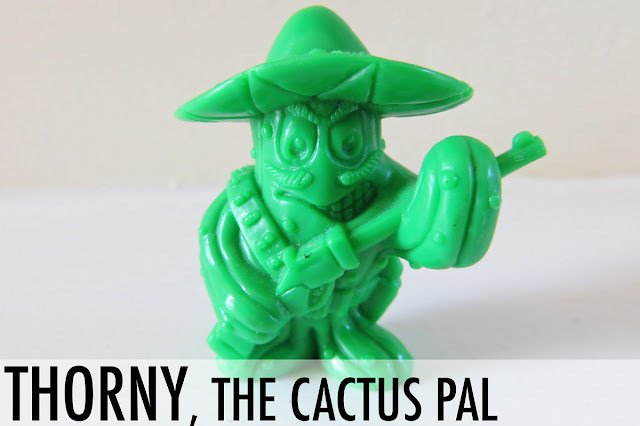 But thankfully for Thorny, his indestructible plastic has kept him green since the 90s. 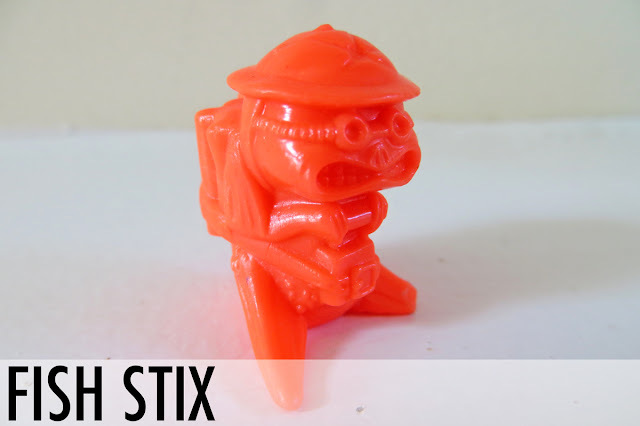 PACKAGING DESCRIPTION: "He sticks to ya!" 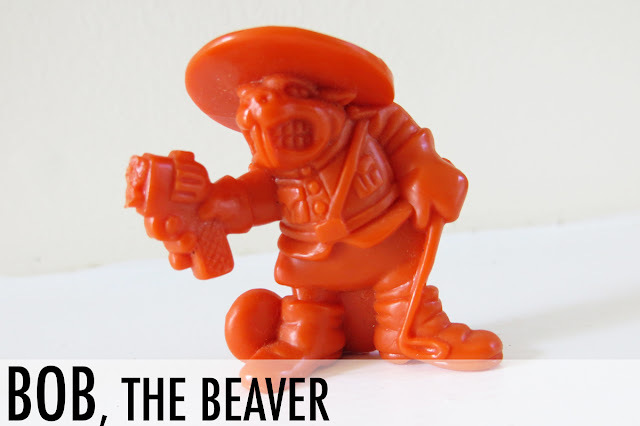 Bob, The Beaver - another sidekick who's packing heat AND wearing a hat. Toy creators must've thought that was the winning formula. 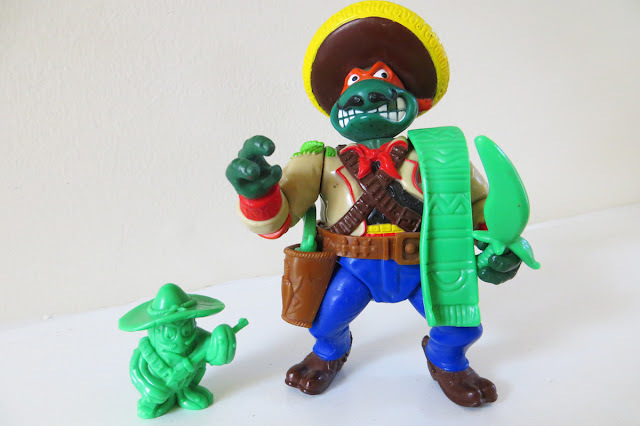 A real cowabunga combination. Toss in gigantic teeth, fancy boots with sleek gloves, and kids couldn't resist. PACKAGING DESCRIPTION: "A wild wood-eatin' friend!" 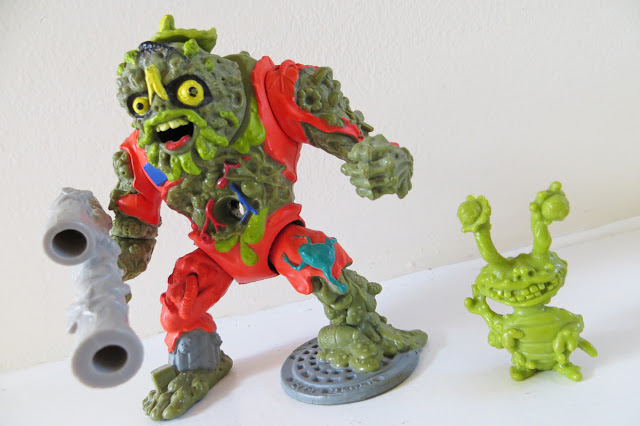 This puke-green sidekick is probably the most familiar. 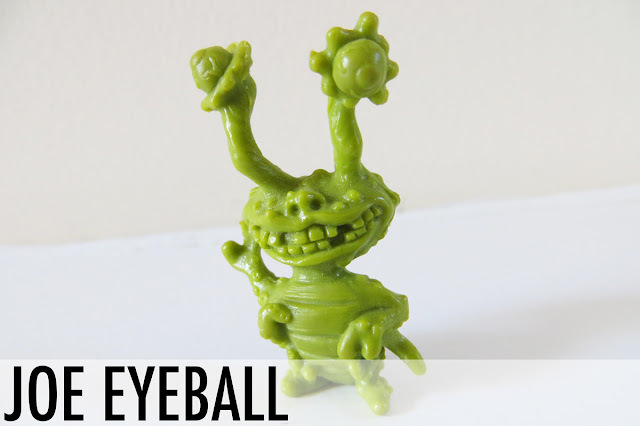 His two floating eyeballs made him a favorite to 8 year old everywhere when he was released back in the 90s. Any kid would be happy to befriend this filthy, little freak as a companion. The adventures would be limitless! Dumpster-diving, landfill-combing, trash-playing - Joe does it all. More than anything else, I want to see Joe Eyeball with a set of braces and a pair of glasses. He'd morph from TMNT sidekick to Revenge of the Nerds cast member. PACKAGING DESCRIPTION: "The decomposing parasite with super-sewer eyesight!" Don't get out the bug spray just yet. Flyboy is a good guy with no one to hurt but the Foot Clan. His bulging eyes, antennae, and 6 limbs give the insect zippy charisma. His body language channels a Pee-Wee Herman-like personality, expecting him to blurt out quips like, "I know you are, but what am I?" Awesome or annoying? The scales could tip either way for this sidekick. 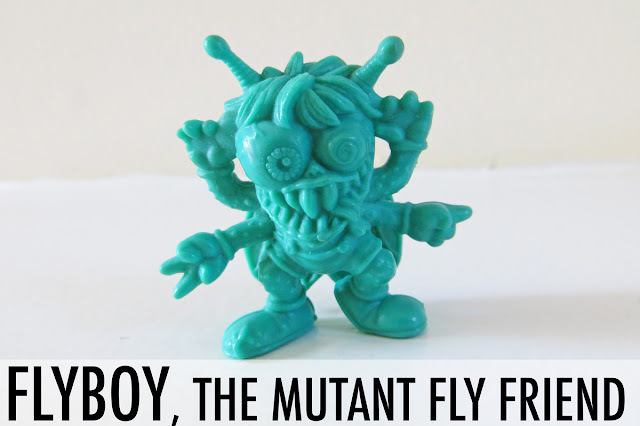 PACKAGING DESCRIPTION: "The buzzy bug with bad breath!" Dogs are usually extremely cute in pet clothing. A miniature outfit gives them human characteristics. 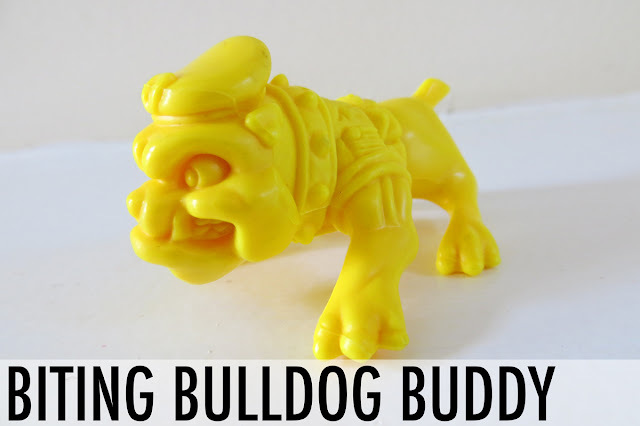 But, Biting Bulldog Buddy's wardrobe isn't doing him any favors. The canine accomplice has a face only a mother or mutant could love with his pudgy cheeks, deep eyes, and an unwelcoming overbite. Couldn't they at least given him tail-articulation for wagging? PACKAGING DESCRIPTION: "If he licks ya, he likes ya!" Underwater adorable. Fish Stix is a sea creature and nervous nerd. 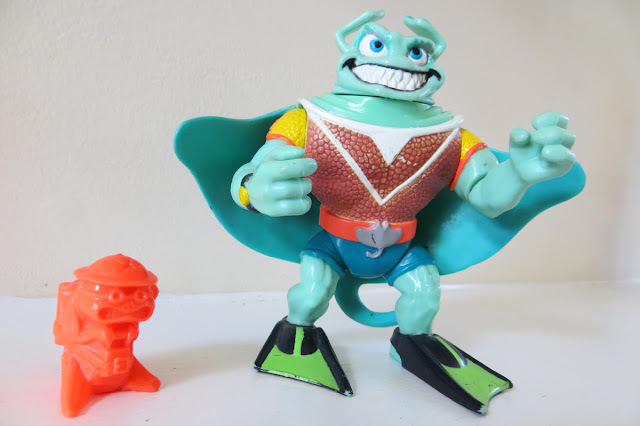 His goofy goggles, dorky hat, and an alarmed expression don't make the sea-dweller a very menacing sidekick. But, maybe that's because the lil guy has a stack of dynamite strapped on his back. And in his grubby, little sea hands (fins? ), is the detonator. Fish Stix holds the fate of all those around him. One false move and he'll set off the underwater explosives making sure you never swim again. Seems a tad dark, no? PACKAGING DESCRIPTION: "A water-breathing, breaded buddy." I don't know much about lemurs, but I know enough to say that they don't usually look like Larry. This tweaked-out, blue buffoon is an amalgamation of everything entertaining. He's a safari-ready, karate kid-embracing, Jim Carrey-inspired screwball sidekick. 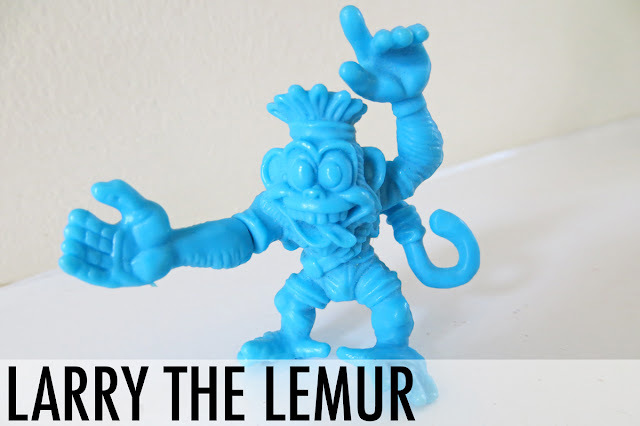 PACKAGING DESCRIPTION: "The pesky primate pal!" What does a stoic, ninja bandanna-wearing snake do for employment? You guessed it, a wrestling coach. 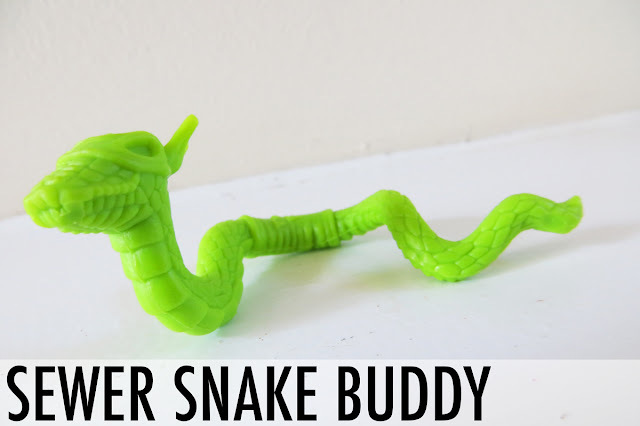 Sewer Snake Buddy conquers evil on a different level with his excellent instruction. Despite the lack of limbs, this streetwise (and sewer-wise) serpent mentors his mutants to the top. He mutates cowards into champions! He also has no articulation and has a hard time standing up by himself. PACKAGING DESCRIPTION: "Coaxes and coaches Mike!" It's a bird, it's a plane, it's Tad "Sidekick" Pole..? The meek fella is trying his hardest. With the makeshift attire and awkward physique, Tad "Sidekick" Pole reminds me of an imaginative kid dressed up in their parent's clothing pretending to be a superhero - trying to save the world from evil-doers, but ultimately stumbling into trouble and just getting grounded. But, as a sidekick? 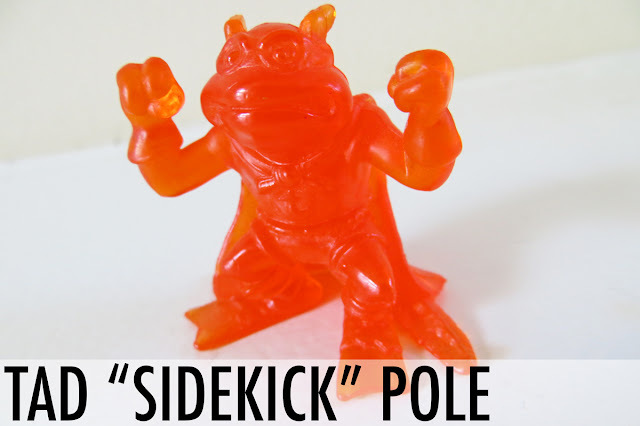 Tad "Sidekick" Pole fits the bill perfectly. His biggest battle is keeping his room clean! PACKAGING DESCRIPTION: "Bite-sized super slipper!" Kid Kangie is scarier than any other creature you'd come across in the Outback. Not only is he threatening with his snarling teeth, but he's flaunting a gigantic weapon and swift-kicking feet. With this surplus of skills, he has the potential to shed his sidekick status more than any other mutant here. If only he wasn't solid orange. A walking jug of Aussie Vitamin C isn't very daunting. 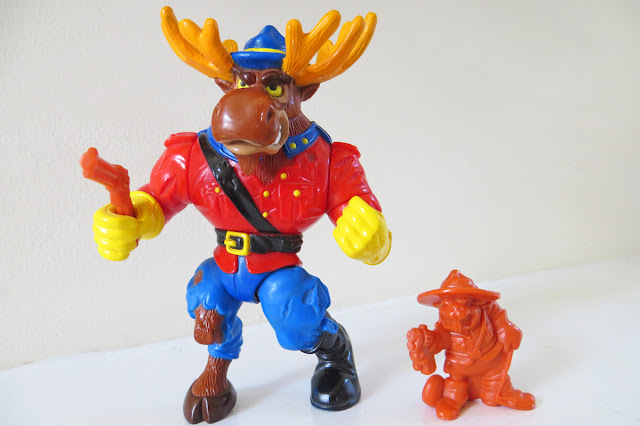 PACKAGING DESCRIPTION: "He may be young, but he's got a mean temper!" So, who wore it best? Which mutant brought the best mutant-sidekick accessory to the show? 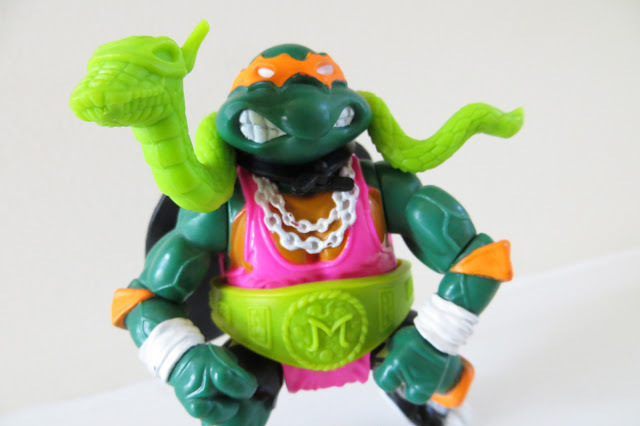 There are many more bodacious buddies in the TMNT universe. In time, they'll get their 15 minutes of fame and a chance to strut their stuff here on The Sewer Den catwalk. I'd love to see their return too. They elevated each figure to new levels of awesome. I didn't even notice Kirby Bat came with a lil bat buddy, had to go back and look. You're on the money - no personality at all. What a shame. 2K3 also had a handful of such companions with no personality. As mentioned before, the 2k3 ones lacked personality. But I did think the sentient basketball one looks kinda cool. My favorites of the bunch are Joe Eyeball and Flyboy. 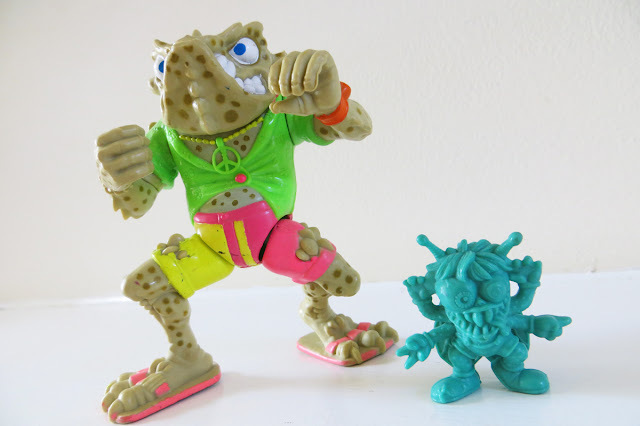 But i dont get them as a kid; at this time (and still today because of his awesomeness and also nostalgia), my favorite was the hippie flower, befriended with Rock n'Roll Mondo Gecko. An amazing minifigure with a very well done sculpt.